Amsterdam by Night is a project of Dutch photographer Wino Wijnen. Have a look at the WiW Photography and NightPhotos websites if you want to see more of my work. Do you have questions, remarks, or do you want to receive the latest news via e-mail? Just fill in the contact form below. I'll try to answer your questions as soon as possible. Also feel free to leave me some suggestions about nice areas or unknown stories of the city. You can also leave a message in the guestbook at the bottom of the page. Subscribers to the Amsterdam by Night Newsletter are the first to receive the latest news and receive special offers. 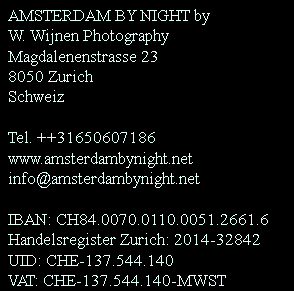 They also participate to win a Photobook "Amsterdam by Night" for every 1000th follower on the Facebook page. Are you organizing a special event and interested in a presentation about "Amsterdam by Night"? That is possible: a standard presentation of 1,5 hour provides a historic overview of the growing city. Special focus on specific periods or themes is also possible. Presentations can be given in English or Dutch. Please feel free to contact me for further information.